A POOL. FILLED WITH SPRINKLES. Update: The Museum of Ice Cream has finally announced its opening date. The exhibition will run April 22 through May 29, and tickets go on sale Monday, April 3 at 9 a.m. ($29 for adults, $18 for children and seniors). If you have an AMEX Platinum card, you can snag tickets early on Thursday, March 30 at 9 a.m. All other AMEX cardholders can purchase tickets beginning Friday, March 31 at 9 a.m. And while the exhibition is mostly ice cream-free, the museum will be offering a “scoop of the week” from local creameries including McConnell’s, Salt & Straw, Coolhaus, and CREAM, plus a special tasting with purveyors of mochi ice cream, My/Mo. Tickets include two ice cream tastings and other surprise treats. The Museum of Ice Cream is coming to Los Angeles next month. The insanely popular art installation/big kid playground/shrine to frozen dairy opened in New York last summer and sold 30,000 tickets in five days. 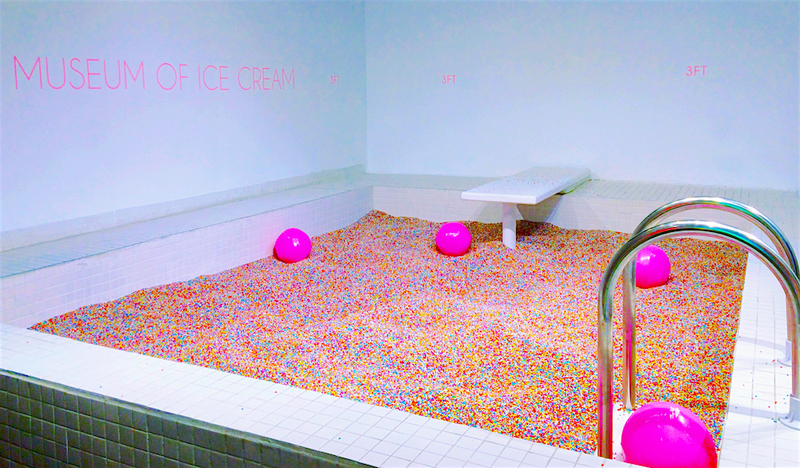 The original location across from the Whitney Museum featured rooms filled with artwork and interactive attractions dedicated to dessert themes like chocolate, cones, and rainbow sprinkles. According to online job postings, the new location appears to be in Santa Monica or Venice Beach. Sponsors of the original show included the dating app Tinder, which created a Neapolitan ice cream sandwich swing and a giant scoop-shaped teeter-totter balanced on a mound of melting strawberry. The adult-sized ball pit filled with sprinkles, the wall of waffle cones, and the neon lettering are tailor-made for Instagram, and we can only expect more when they get to California. There’s one thing that isn’t very clear. Though there will certainly be the helium-filled edible balloons, there may not be any actual ice cream served at the Museum of Ice Cream. Next articleIt’s Time to Bring the ‘Dutch Reach’ to L.A.